Last year saw the 45th anniversary of Roxy Music’s unconventional eponymous debut album, originally released in June of 1972. Tomorrow, in celebration, Virgin/Ume will reissue the album in a Super Deluxe Edition. Led by the quivering vibrato and grand theatrics of vocalist Bryan Ferry and the strange, highly-influential synth-scapes and tape manipulations of Brian Eno along with the vital contributions of guitarist Phil Manzanera, saxophonist/oboist Andy Mackay and drummer Paul Thompson; Roxy Music’s debut was the perfect showcase for their hybridization of spacey glam-rock and sophisticated art-pop that was well ahead of its time. The band’s forward-thinking avant-garde sound was an influence evident in a wide range of bands such as Radiohead, Arcade Fire, Shudder To Think and even Sonic Youth in the years following its release and this new comprehensive set will ensure their influence on new musicians for many more years to come. The 3CD/DVD Super Deluxe Edition of Roxy Music features the original album remastered in 1999 by Bob Ludwig and includes a treasure trove of previously unreleased material including, early demos from 1971 that show the songs in the earliest state and album outtakes with alternate versions for each track as well as live BBC and Peel radio sessions. The DVD features the entire album newly remixed in 5.1 by Steven Wilson as well as four rare performance videos that include a BBC TV performance and live performance footage recorded at the Bataclan Club in Paris in November 1972. 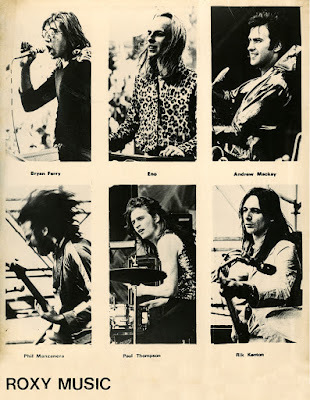 As an additional visual component, a 136-page hardcover book that features numerous rare photos and a lengthy essay by Guardian journalist and author Richard Williams, the man who first wrote about the group in Melody Maker in 1971, completes the set. In addition to the Super Deluxe Edition, the reissue is also available digitally, as a Deluxe 2-CD set with a 24-page booklet and an LP pressed onto180g vinyl.